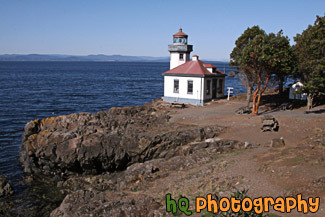 A scenic picture taken of the Lime Kiln Lighthouse which is located on the San Juan Island. Lime Kiln Lighthouse is located on the west side of the island. It was built in the 1860's. This is also the site of a whale watching park to observe whales from the land.